Owning a successful Information Technology company, providing Ipad based Point of Sale Systems for the hospitality industry since the mid noughties, Brennen and Brown founder and Managing Director, Rich Bamber found himself turning his love of gin and ginger into a fast growing business of it’s own. In 2012, after being asked to install an Ipad till into a well known distillery in London for their new bar. Rich asked the distiller if there was a gin with ginger as the predominate flavour. The distiller said there had been one, although that was over 100 years ago, but unfortunately it no longer existed. These words set Rich off on a path of amazing discovery. After a lot of research, Una our first Still arrived along with an array of botanicals. 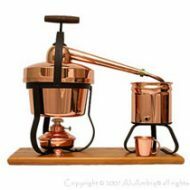 Una, a minature, traditional Copper Still was chosen, to be traditional but also because copper as a metal has many positive characteristics that make it the preferred metal when making stills, copper actually reacts with alcohol on a molecular level making the final spirit taste better. With help from his partner Jo Hazlett , an already established Chocolatier and with a bit of trial and error with quantities and flavours, Una produced Brennen and Browns first batch of Gin with a hint of Ginger. We found that people within the Gin & Vodka industry were very friendly and helpful. Offers of help were never very far off. Taking our original recipe to Master of Malt, who produce their own spirits and own an established labratory, Brennen and Browns Gin with a hint of Ginger became an established recipie and was successfully finalised. Masters of Malt introduced the Brennen and Brown team to Rotary Evaporator Stills. Soon to be our choice of Still, which is when ‘Gin-Of-Eve’ joined the team and production began in earnest. Gin-of-Eve, Brennen and Browns first Rotary Evaporator Still. Rotary Evaporator Stills allow for a gentle, precise and efficient distillation not found in conventional distilling apparatuses. Laboratory condensers, being sealed and made of glass, are easy to visually monitor and adjust. Keeping the mixture evenly mixed and heated to promote stable, even evaporation concentrating the purest and freshest flavors. 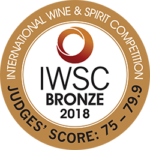 Thus allowing Brennen and Browns Flavour Team to extract the aroma and flavor molecules from mixtures gently and at low temperatures (for example, extracting the desired flavors from a blend of alcohol, spices and fruit without heating the mixture up). Creating the tastiest, freshest flavoured artisan Gins and Vodkas. Brennen and Brown had lots of interest from local businesses; bars, night clubs and shops who like to support local and the interest continued spreading further a field very quickly. Brennen and Brown found with growing demand, we needed to produce 1000 bottles per week and Gin-Of- Eve produced 3 bottles an hour. 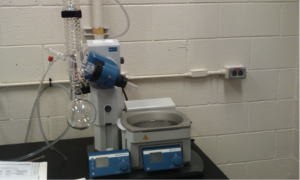 As demand grew we made the decision to purchase two more rotary evaporators, Heidi our Heidolph Rotary Evaporator and Flo-Mo our Hydrion Scientific Rotary Evaporator, to match the demands. 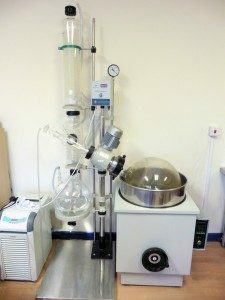 Gin-Of-Eve is now our new product test rotary evaporator, we make small batches of new products ideas to be tested by our dedicated team of tasters. Yes we do get inundated with offers to become part of this team. If you would like to apply to become a new product taster please do get in touch. Once the product has been approved production moves on to Heidi or Flo-Mo, depending on how big a run we want to make. Rich now concentrates on the day to day running of the Brennen and Brown team, while Jo is in charge of the social media and the Flavour Nurseries Team. Brennen and Brown make, bottle and label in-house, insuring the best possible product reaches the customers. We are in the process of building a Ginsperational Tasting Room to complement our experiences. This will give Gin and Vodka fans the unique opportunity to be a mixoloygist and learn how to make, and taste Gin or Vodka the Brennen and Brown way. Why Brennen and Brown, well that bit was easy, they are Rich’s Grandmothers maiden names. Two lovely ladies that enjoyed the odd G&T themselves!